Last time, I explained how adders work in CPUs, and one nice trick for speeding them up. Be sure to read part 1 before diving into this! If both inputs are 0, the carry will definitely be 0, so the carry is “killed”. If both are 1, the carry will definitely be 1, so a carry is “generated”. Both of these cases are the same whether the carry-in is 0 on 1. But if only one of the inputs is 1, then we’ll only have a carry-out if we had a carry-in, so a carry is “propagated”. We can use “G” to mean a 1-bit adder would generate a carry by itself, and “P” to mean it will propagate its incoming carry. So, for any column, the carry-out will be 1 if either “G” is 1 (it generates a carry), or “P” is 1 (it propagates a carry) and the carry-in is 1. The fun comes when you consider the second bit. It will have a carry-out if it generates one, or it propagates one and the lowest bit generated one, or it propagates one and the lowest bit propagates one and the carry-in was 1. This series can go on indefinitely. If we compute a G and P for each column, then we can compute the carry bit for a column N by making an OR gate with N + 2 inputs, each of which is a G and a string of Ps, with the last AND gate having N + 1 inputs. We could compute each carry bit in 3 gate delays, but to add 64 bits, it would require a pile of mythical 65-input AND and OR gates, and a lot of silicon. So the sum for any column is just an XOR of the carry-in bit and the P bit that we already computed for our carry-out. That adds one more gate, for a total of 4 gate delays to compute the whole 2-bit sum. 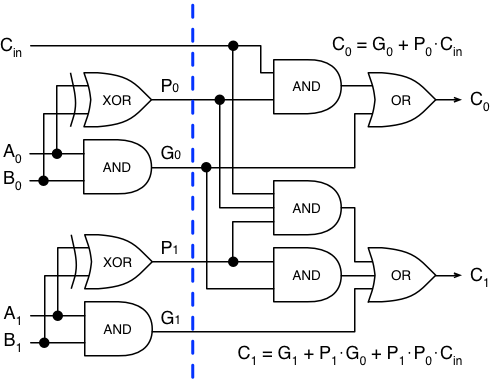 If we built a set of 4-bit adders this way – assuming a 6-way OR gate is fine – our carry-select adder could add two 64-bit numbers in 19 gate delays: 3 for all of the carries to be generated, and 16 for the muxes to ripple down. These ripples now account for almost all of the delay. In 1973, probably while listening to a Yes or King Crimson album, Kogge and Stone came up with the idea of parallel-prefix computation. Their paper was a description of how to generalize recursive linear functions into forms that can be quickly combined in an arbitrary order, but um, they were being coy in a way that math people do. What they were really getting at is that these G and P values can be combined before being used. Any time we can do a recursive combination like this, we’re in log-scale country. This is the country where cowboys ride horses that go twice as far with each hoofstep. But seriously, it means we can compute the final carry in an 8-bit adder in 3 steps. Wait, what? Well, the numbers at the top represent the computed P and G bit for each of the 8 columns of our 8-bit adder. The diamonds combine two adjacent sets of columns and produce a new combined P and G for the set. If this works, at the bottom, each arrow should represent the combined P and G for that column and every column to its right. Look at the line on the far left, and trace it back up. It combines the lines from 7 and 3, and as we trace that up again, each of those combines two more units, and then again to cover all 8 columns. The same path up should work for each column. This final step adds three gates to the end of each column. As we saw above, each combining operation is two gates, and computing the original P and G is one more. 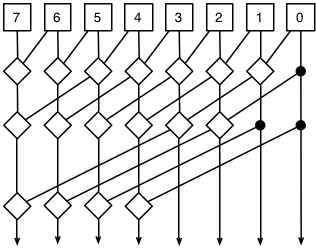 For this 8-bit adder, which uses three combining steps, we wait 1 + 3⋅2 + 3 = 10 gate delays for the result. 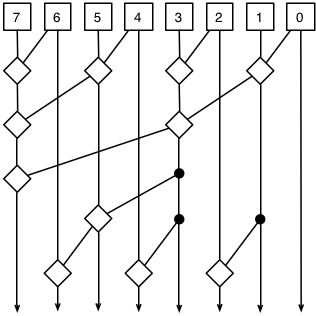 For a 64-bit adder, we need 6 combining steps, and get our result in 16 gate delays! The Kogge-Stone adder is the fastest possible layout, because it scales logarithmically. Every time we add a combining step, it doubles the number of bits that can be added. It’s so efficient that 25% of the delay in our 64-bit adder will be the setup and final computation before and after the combining phase. The only real flaw is that the number of wires gets a little crazy – the 8-bit adder is already filled with cross-connections, and that gets so much worse in the 64-bit version that I’m not going to try to draw it. It might even monopolize a lot of the chip space if we tried to build it. Luckly, there’s a compromise that adds a few steps but removes a lot of the wires. One potential problem is “fan-out”, which means one outgoing signal is being sent to several other gates as inputs. Electronics people would say one gate is “driving” a bunch of other gates, and this is bad, because the current gets split several different ways and diluted and weakened, just like water through a fork in a pipe. You can see this especially in column 3. A Brent-Kung adder will actually turn the joints (that I’ve marked with black circles) into buffers, or gates that don’t do anything. That reduces the fan-out back to 2 without slowing anything down. One thing you might have spotted with your eagle eye is that the Brent-Kung adder doesn’t slow down the left-most column, which generates the final carry- out bit. So if we were to combine this strategy with the carry-select strategy from last time, our carry bits could start rippling across the adder units before each unit finishes computing the intermediate bits. Hmm. An n-bit Brent-Kung adder will be able to generate the carry-out bit in log2(n) steps, using 2 gates per step, with an additional gate delay for computing P and G for each bit, and two extra gate delays to compute the carry-out from the combined P/G. The full sum will take an extra log2(n) - 1 steps, and an extra gate to do the P⊕Cin operation. 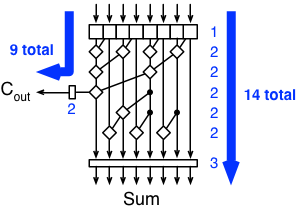 When a carry-select adder is used with k units, the ripple delay is k plus the time it takes to get a carry-out from the first unit. So if we split our 64-bit adder into 8 8-bit Brent-Kung adders, and combine those into a carry-select adder, the 8-bit adders will compute their carry-out bits in 9 gate delays, after which the carry bits ripple through the muxes for 7 gate delays, for a total of 16. The sum bits are available after 14 gate delays, in plenty of time. So we got it down to 16 total, and this time in a pretty efficient way! Adding numbers: Proof that humans can make anything complicated, if they try hard enough. There are a bunch of other historical strategies, but I thought these were the most interesting and effective. If you stuck it out through both articles, I’d love to hear your thoughts, ideas, and/or corrections.